Quite a while back, I was introduced to the blog points system from Passionate Blogger (referred by Judy Gombita of PR Conversations). I forgot all about it until today, and decided that this system would be a good tool to help me better manage my multiple blogs. The idea is simple... to be a better blogger you need a certain amount of consistency, and you can't completely slack off (which I'm incredibly guilty of at times). The blog points system allows you to assign yourself a "points goal" for each blog you run, and you can assign point values to various tasks (like commenting on a related blog, writing a long blog post, etc.) to help you reach your point goal for your blog(s). I like the idea overall a lot (and I believe it's actually derived from another similar system). However, I made some changes to it to better fit my own needs. The changes I made where going with a weekly point goal instead of daily, and adding quite a few tasks which I've assigned points to. While Passionate Blogger suggests setting a goal of 50 blog points per day per blog, I chose 150 per week instead. Your goals can be anything that works for your own schedule and the number of blogs you're running. In my case, on top of my PR firm, I have six primary blogs that I'll be focusing on right now, with a seventh in the new year. You can opt to track your points over any time period really as long as you set your goals based on that. I'm also choosing to print out my worksheets and add tics to the quantity box for each through the week, totaling them at the week's end. You can also do it directly in your Excel spreadsheet (which you can download from the Passionate Blogger site). I'm in front of a screen enough all day, so when I can do something like this by hand elsewhere, I usually take advantage of it. That’s a great list -problem is that everytime you launch another website or blog you give your self a new list to do! What do you mean write a piece of linkbait? Linkbait is a post that naturally attracts backlinks. Some people write them just for the sake of links (like fake news with sensational headlines). Others combine the link benefit with providing something useful for readers. Controversial posts are actually good linkbait, but I included them separately in the list because I use them often on some of my blogs, and it helps me keep track. Other kinds would be things like a list of 101 tips, a top ten list, an expose, an interview with someone really significant in your niche, etc. 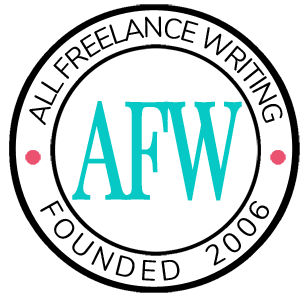 On another note, I already exceeded this week’s goal of 150 blog points for All Freelance Writing (even after only starting Wednesday for the most part, and still having two days left). I really didn’t think I’d hit it, and this is the first blog I’m pushing the points system on. I made it because of a few things combined: more posting than usual, launching a contest, planning a new feature (the 12 days of Christmas feature), three newsletters that went out this week due to the amount of updates, and launching a new regular feature (the Freelance Fridays feature).